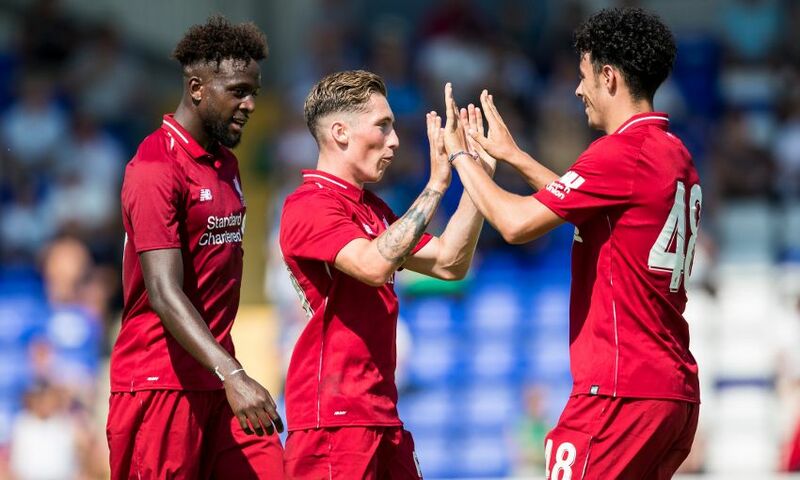 Fabinho and Naby Keita made their debuts as Liverpool began their pre-season programme with a 7-0 win at Chester FC on Saturday afternoon. The midfield duo played a half each at the Swansway Chester Stadium to help the Reds kick-start their preparations with a victory. Harry Wilson struck twice in the first half to give Jürgen Klopp's side a two-goal advantage at the break before James Milner’s penalty shortly after the interval furthered the lead. Daniel Sturridge and Ryan Kent then got their names on the scoresheet with two goals in three minutes and Danny Ings made it six with a sweeping finish from 12 yards. Sturridge rounded off the scoring with a minute to go when he found the bottom corner from distance. First half: Karius, Clyne, Gomez, Phillips, Moreno, Fabinho, Jones, Woodburn, Wilson, Solanke, Origi. Second half: Ward, Robertson, Klavan, Chirivella, Camacho, Milner, Keita, Kent, Ojo, Ings, Sturridge. With five minutes gone, Divock Origi fashioned the first opportunity of the afternoon, gliding into the area from the right and drilling towards goal. Grant Shenton could block and then collect at the second attempt. Nathaniel Clyne raided forward before dragging a low attempt wide of the far post; however, Chester could have taken the lead when Jordan Archer broke clear and found himself one-on-one with Loris Karius. The striker’s attempt to steer beyond the goalkeeper was thwarted by his boot, which looped the ball onto the roof of the net. Dominic Solanke then had a strike deflected wide, while Origi was thwarted by a sprawling stop from Shenton when bearing down on goal. Liverpool were exerting more and more pressure on the hosts’ goal the longer the first half progressed. Fabinho cannoned a drive against the base of the post from the edge of the area and Harry Wilson’s attempt to prod home was saved by Shenton. But the breakthrough finally arrived in the 37th minute. Solanke switched play across field into the path of Alberto Moreno, who strode into the area but had his shot blocked by Shenton. However, the loose ball broke for Wilson, who deftly lofted it over the grounded ‘keeper and into the net. The Wales international added a second before the break to give a scoreline a more handsome look as he nudged Curtis Jones’s excellent through ball into the bottom corner from close range. Liverpool made 11 changes at the break, with Keita coming on for his debut for the club – and they required only three minutes to add to their tally. Sturridge slipped a fine ball beyond the defence to meet Sheyi Ojo’s run, but the youngster was sent sprawling to the turf after being brought down by Shenton when attempting to round him. Milner assumed spot-kick duties and duly converted with typical aplomb. The Reds then struck twice in the space of three minutes with Sturridge netting with a fine finish after Keita won possession back on the edge of the area before Kent darted in from the left and clipped an unerring effort into the far corner. Keita had an opportunity to mark his debut with a goal when he was played through by Ings, but scooped over the crossbar while off balance, prior to Sturridge seeing an audacious chip from the corner of the box land on the roof of the netting. Ings did grab a sixth goal for Liverpool when he swept in first time from Milner’s intelligent flick into his path 12 yards out. Sturridge wrapped up the scoring with a exquisite arching finish from the edge of the area to ensure the Reds got up and running with a comprehensive win.